When you think of the Philippines you’re most likely going to picture turquoise waters, white sand, and the perfect tropical paradise. These beaches you’re thinking of are getting awarded the best beaches in the world and rightfully so. So for those who are planning a trip to the Philippines may not know that there are more places to see in the Philippines, a beautiful country that is way more than a honeymooners retreat. Luzon is the largest island of the Philippines and is home to Manila, the capital metropolis of the country. Where most people leave Luzon, we decided to stay and discover the beauty on this underrated destination for travelers and find out it’s one of the best places to see in the Philippines along the way. Check out our picks for the best places to see in the Philippines on Luzon including the best things to do in Luzon and the best things to do in Manila. 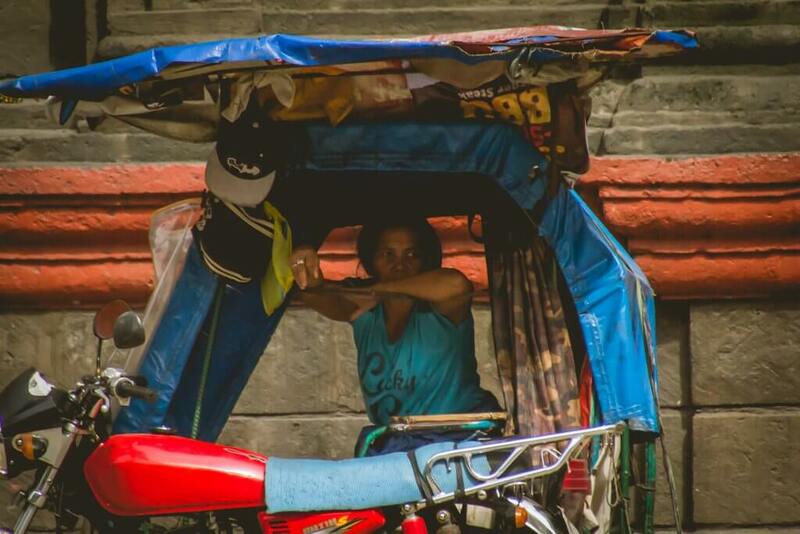 The country’s capital and a bustling city with some of the worst traffic we have ever experienced should not be missed on your trip to the Philippines. Even if you only have a day to spare you should not miss the local metro hub. Look around and you’ll see skyscrapers, Spanish colonial buildings, and the world’s largest shopping malls! One of the best things to do in Manila and something we highly recommend visiting is the ancient walled city of Intramuros. Check out Carlos Celdran’s tour dates as he is said to have the best-guided tours with stories in all of Manila. Sadly, we were unable to experience this ourselves since there were no tours for the dates we were in Manila. 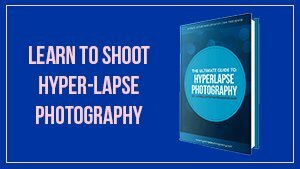 Be sure to plan ahead! Another one of the best things to do in Manila is visit Asia’s oldest Chinatown, Binondo! Eat your way through Binondo by yourself or with Old Manila Walks. The tour is three and a half hours long and full of incredible food to try plus check out the local sites. We came with an empty stomach and left so full we felt like we had to be rolled out of the place. Be sure to also check out the best day trips from Manila. Just south of Manila on Luzon, Tagaytay is a popular local holiday town. Tagaytay’s most famous spot to visit would be the still active Taal Volcano. The volcano is the second most active in the entire country and offers incredible views making it one of the best places to see in the Philippines and one of the best things to do on Luzon! When we visited we felt like we were in some sort of volcanic inception. It’s actually so confusing I am not even sure we quite understand. 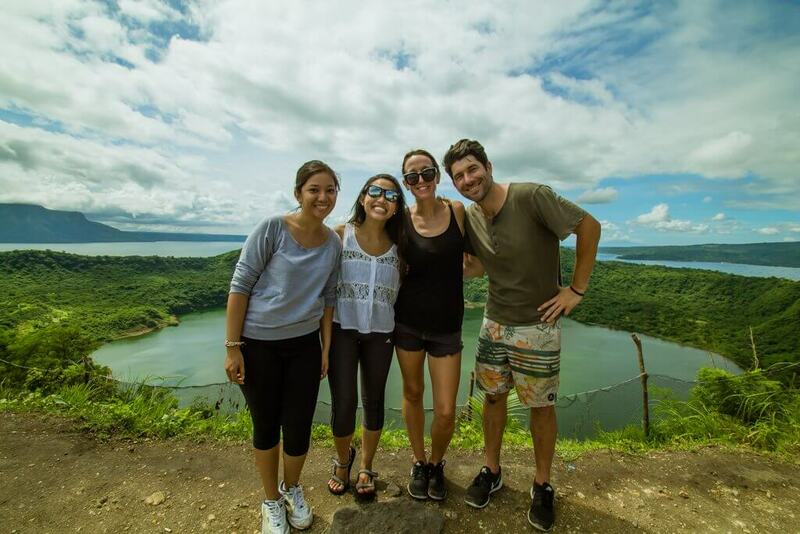 Taal Volcano Lake is a volcano that has a caldera that you climb to see another lake. WHAT? Essentially there are two different bodies of water you will be looking at a lake with a volcano with a lake. It makes our heads spin, but take our word for it, it’s beautiful and worth the short climb to the top for panoramic views! You can make the visit to Taal Volcano as a day trip from Manila, but we advise leaving before the sunrise to beat some of the traffic! 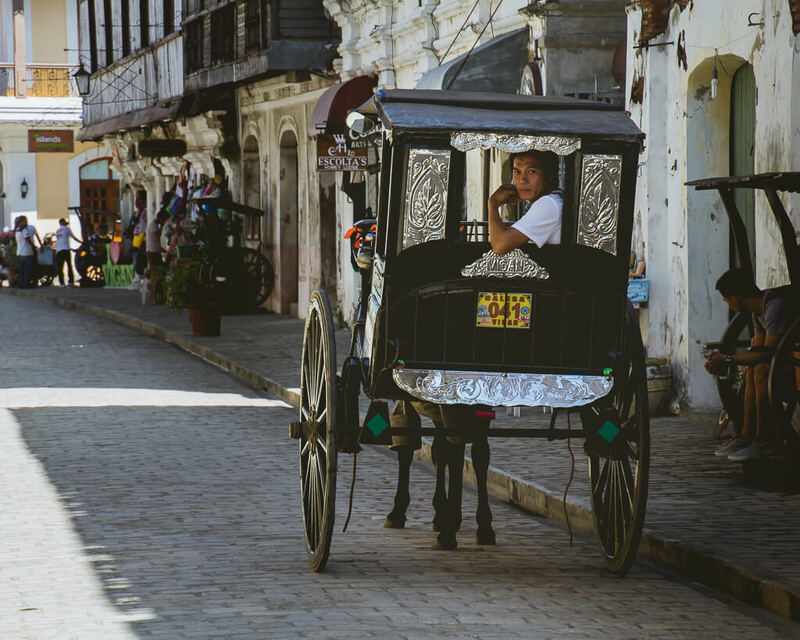 If you’re into picturesque historical towns then Vigan is the place for you. This 16th century UNESCO World Heritage Site attracts tourists to explore the cobblestone streets with horse-drawn carriages and beautifully preserved Spanish architecture. Hangout on the historical main street where you can ride a horse carriage, shop for souvenirs, and snack on local foods. 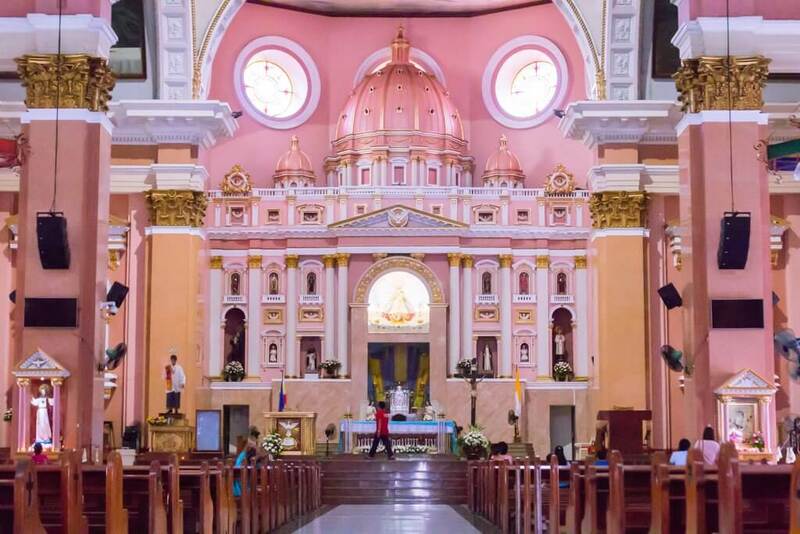 Admire the area’s old mansions and beautiful architecture with influences from the Philippines, China, Spain, and Mexico. 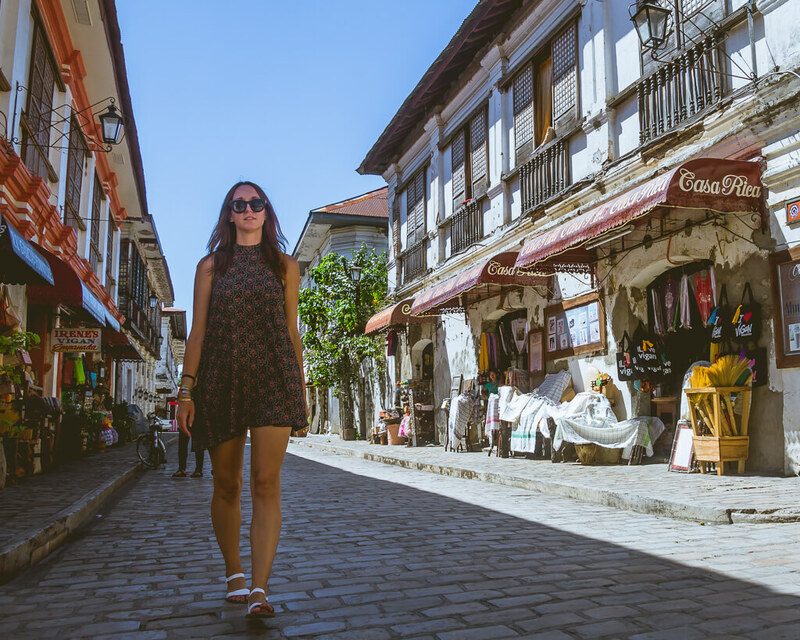 You won’t find any place like Vigan in all of Asia which is why this is one of our favorite places to visit in the Philippines and best things to do on Luzon. Be sure to also check out Plaza Burgos where you can find tons of food. Do not leave Vigan without trying their local empanadas! If you’re looking for a unique place to stay, check out Hotel Luna in Vigan. The hotel has an art museum inside and is the only hotel of this kind in all of the Philippines. Located in Ilocos Norte, Laoag has been called the sunniest place in the Philippines! 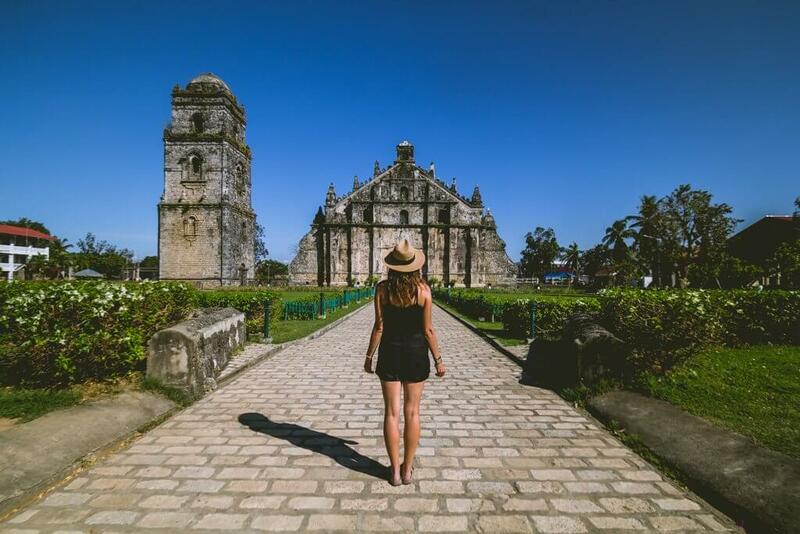 But that’s not all Laoag offers there’s so much more making it one of the best places to see in the Philippines most visitors don’t know about. Check out the gorgeous St. Williams Cathedral with the sinking bell tower. The bell tower has been slowly sinking into the earth’s soil. It has been said that the tower’s door was able to fit a man on a horse in the past, now thanks to the sinking a person can’t even walk through the door. 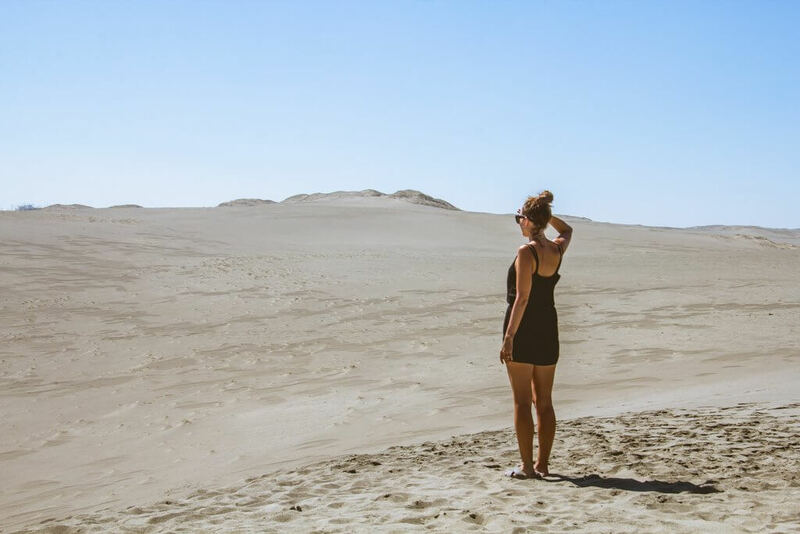 Located just a few minutes drive out of town are the breathtaking La Paz sand dunes next to the sea. This was one of the highlights from our road trip and favorite things to do in Luzon. Hop on a buggy and hold on for dear life as the driver will take you down some crazy hills. If you’re looking for an extra adrenaline rush then take a stab at sand boarding. Be sure to wear shoes or socks with your sandals as climbing back up the hill in that hot sand was torturous! You will not be able to get around Laoag easily without a car, so either rent a car or hire a driver for the day and explore the beauty in Ilocos Norte. If you’re a cheese lover like us, look for the local cheese made by Carbau (aka water buffalo). The cheese is light and fresh and can be eaten alone! This was one of our favorite treats to try! Baguio is a popular and urbanized mountain town on Luzon and one of our picks for best places to see in the Philippines. 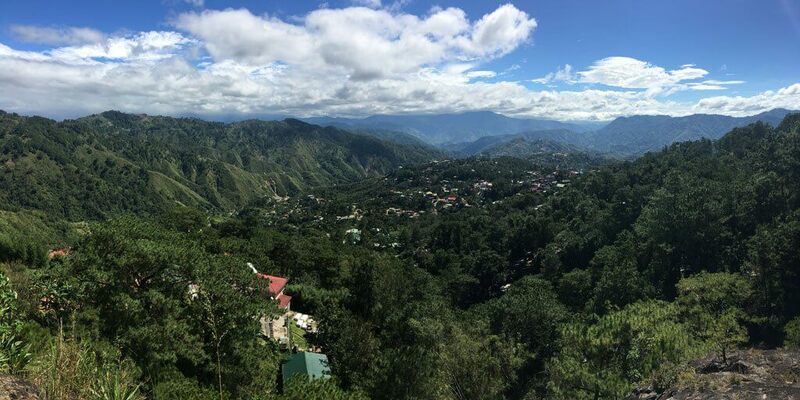 Baguio offers a lush scenery and cooler temperatures. Enjoy trail riding on horseback, shop the local markets, or just go for the great views. We loved the panoramic views from the Baguio city market. Stroll the streets of small vendors selling local souvenirs, local delicacies like ube spread, and exotic plants and succulents. Just past the shopping, there’s an incredible view overlooking the mountains of Baguio where people flock to witness the beauty. 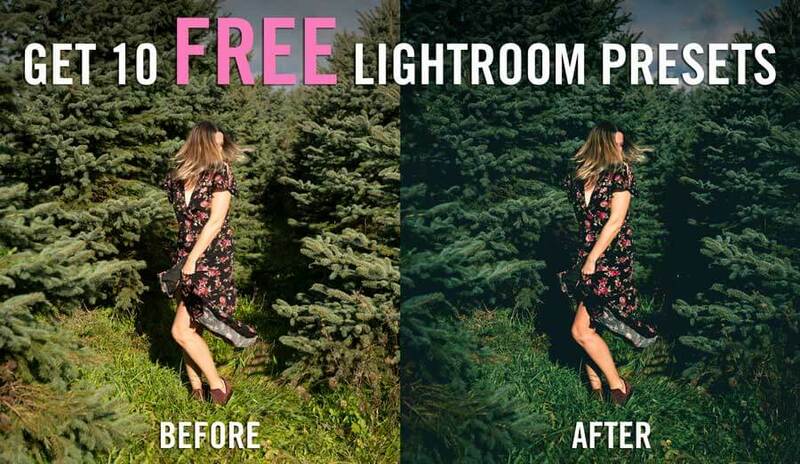 Watch out for the pink and white ponies around here too. Make sure to keep your eyes open when driving on Kennon Road for the famous lion head and even a waterfall! Be sure to try Strawberry Taho from one of the street vendors during your trip to Baguio! It’s a small, sweet cup with soft tofu, tapioca beads, and strawberry pure! Located not too far from Laoag City in Ilocos Norte is Adams, an even more rural destination offering a unique and cultural experience. You can hike to the different villages, but be prepared as they can take up to 3 hours to hike! Hiking is common here as there are 18 different waterfalls and 10 hanging bridges in the area! If you plan your trip in mid-April then you could catch the Tadek- Bagat Festival featuring the different tribes of Adam’s dances and songs. A little harder to get to, but well worth the journey is Sagada in the Cordillera Mountains. This area is full of natural beauty and flora and fauna and is one of the most naturally beautiful places to see in the Philippines. 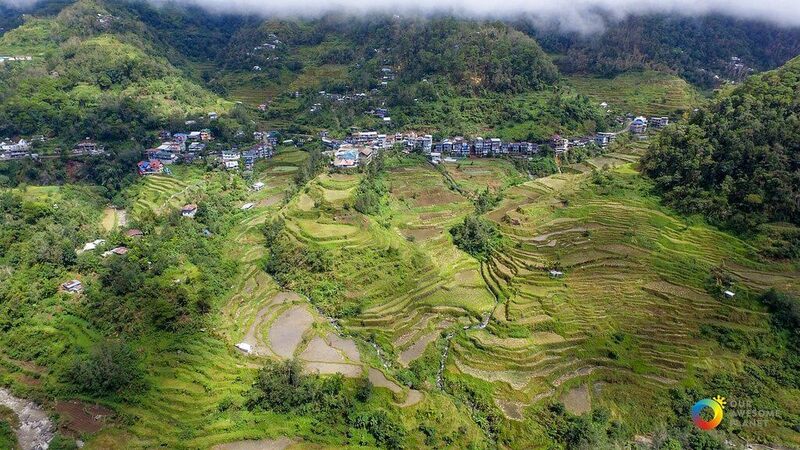 Behold the beauty of the rice terraces, caves, waterfalls, and lush mountains. Be sure not to miss the hanging coffins of Echo Valley. Coffins with dead bodies fill the walls of this cliffside offering one of the most unique cemeteries in the world. It is said that this burial ritual still is practiced today even! If that’s not enough for you, you can visit Lumiang Cave where there are hundreds of coffins buried as well! A lot of the hikes in Sagada are not for the faint of heart and many require a local guide. Be sure to do your research before your trip to make sure you know which hikes are best for you and your fitness abilities. Check out this guide from Our Awesome Planet for all you’ll need to know before planning your trip to Sagada. Sagada is one of the best places to see in the Philippines if you’re looking for an adventure and a different experience. When planning your trip to the Philippines think twice before skipping straight to the idyllic islands of Palawan or Cebu (which are totally worth it! ), be sure to consider the road less traveled in Luzon, one of the best places to see in the Philippines. 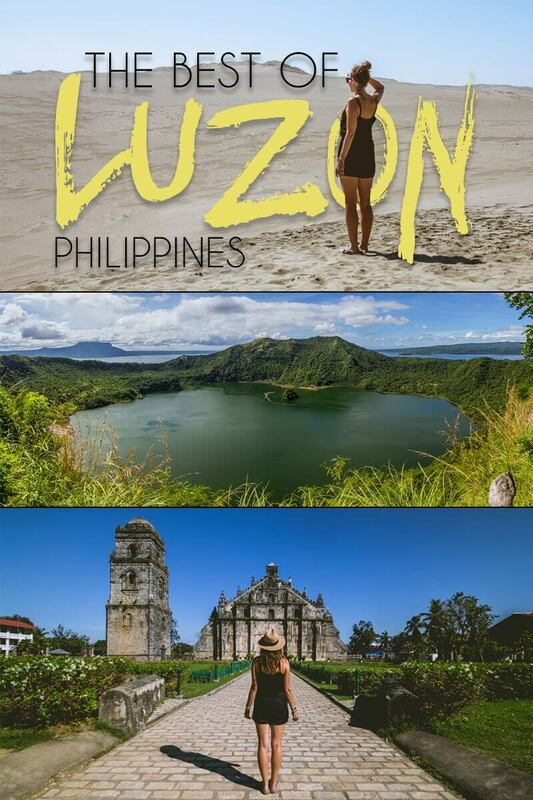 You can also check out some more incredible places to visit on Luzon and in this beautiful country on this two week itinerary for the Philippines. Check out our vlogs from our trip here! 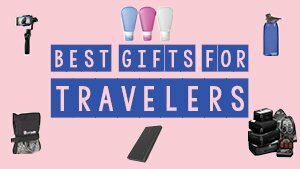 Liked this post on some of the best places to see in the Philippines and best things to do in Luzon? 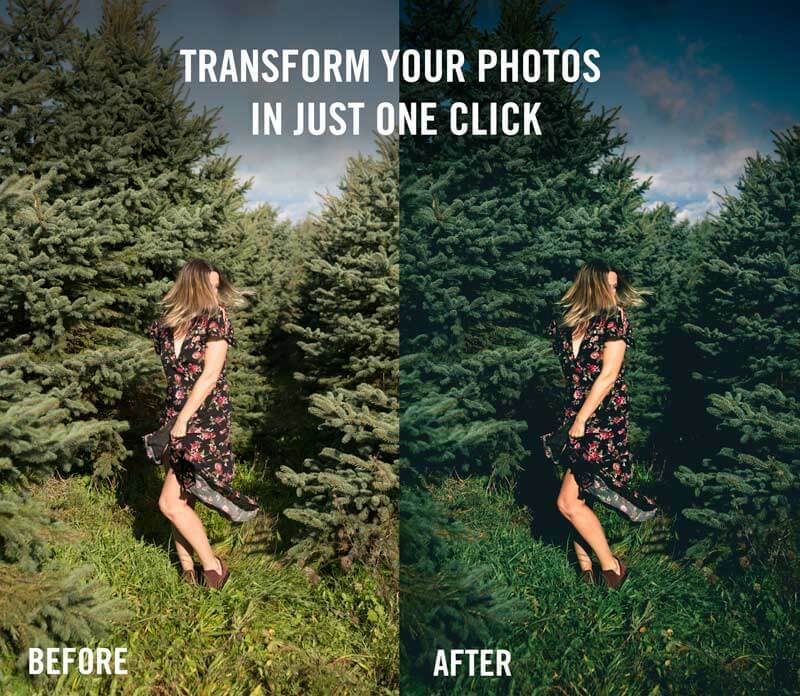 Share the love by pinning it below on Pinterest!